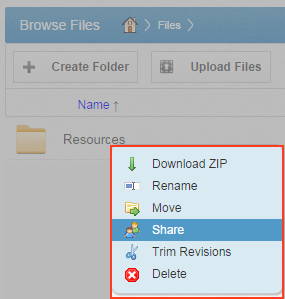 Share links allow you to share a direct link to a file or folder. Share links can be configured for users in your organization and outside of your organization. 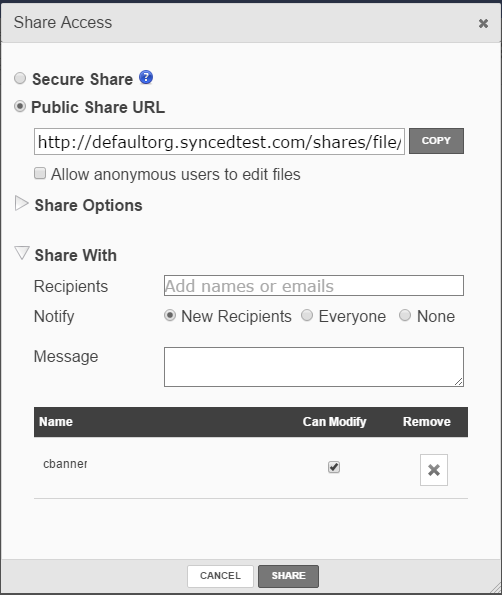 You can send a public share to recipients inside or outside of your organization; alternatively, you can send a secure share, which requires login credentials. If you send a secure share to a recipient outside of your organization, the system will create a guest account for that user. Share links can be created within the web portal, from the desktop client, or from a mobile device. Right-click the file or folder and select Share. A Share Access dialog box displays. The Secure Share option, which requires each user to log in with unique credentials before accessing the shared content. The Public Share option, which sends standard share links to items. The Share Options settings, which allow you to select whether the share link will expire after a certain date, if each recipient should be limited to the number of times the item can be downloaded, and if you would like to be notified through email when the share is downloaded. If you are sharing an entire folder, you can also select to receive a notification when an item is uploaded to the shared folder. The Share With settings, which allow you to email your items directly from within the Share Access dialog box. The Permissions settings, which allow you to view permissions for each recipient. If you are sharing an entire folder, and if the share link is secure, you will be able to set permissions for each recipient, including whether he or she can upload or delete content. 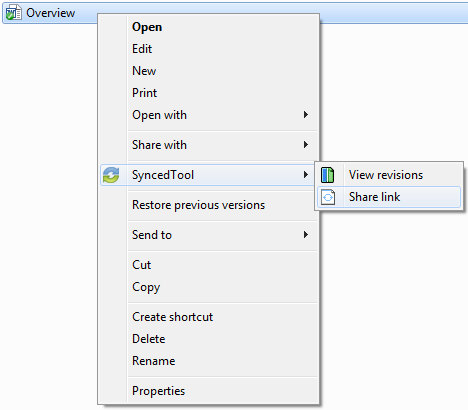 Right-click on the file or folder, point to the SyncedTool menu, and select Share link. The Share Access dialog box displays, allowing you to configure settings the same way as you would from the web portal. The Share Options settings, which allow you to select whether the share link will expire after a certain date, and if each recipient should be limited to the number of times the item can be downloaded. The Permissions settings, which allow you to view permissions for each recipient. If you are sharing an entire folder, you will be able to set permissions for each recipient, including whether he or she can upload or delete content. End users can manage their own share links in the Shares tab of the web portal. In the web portal, click the Shares tab to manage your share links. Click the Items Shared By You button to track how many times an item you shared has been viewed, downloaded, and whether or not it is set to expire on a certain date. You can also click the arrow to expand an item, which allows you to view detailed information about the user that received your shared item. Click the Items Shared With You button to view files that were shared with you by others in your organization, as well as information about who shared the file and what access rights you were given (including read, write, and delete).